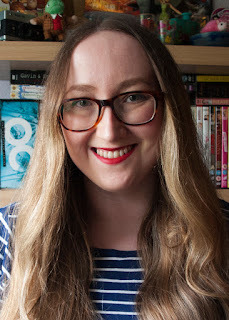 Anastasia Gammon: Primrose Bakery triple layer chocolate cake with caramel icing! Primrose Bakery triple layer chocolate cake with caramel icing! The weather here has been absolutely atrocious recently and nothing gets me down like gale force winds and enough rain to flood half of Cornwall. So when my friend Saruuh suggested that I post a chocolate cake recipe on the blog I immediately grabbed my cookbooks. 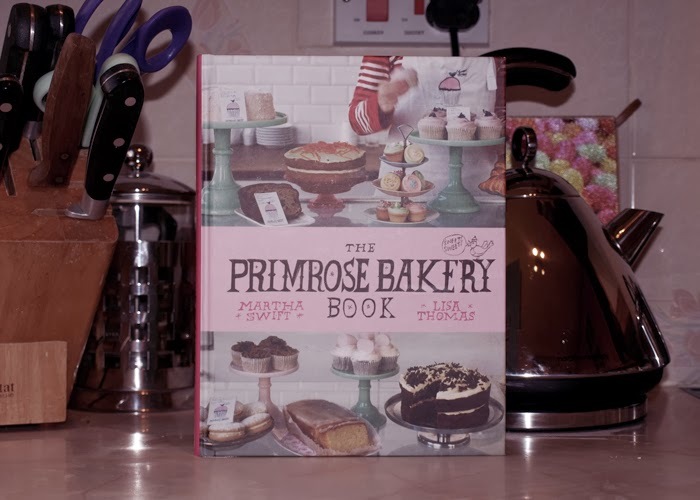 I finally settled on this Primrose Bakery recipe because frankly, with this sort of weather, nothing less than three layers was going to cut it. 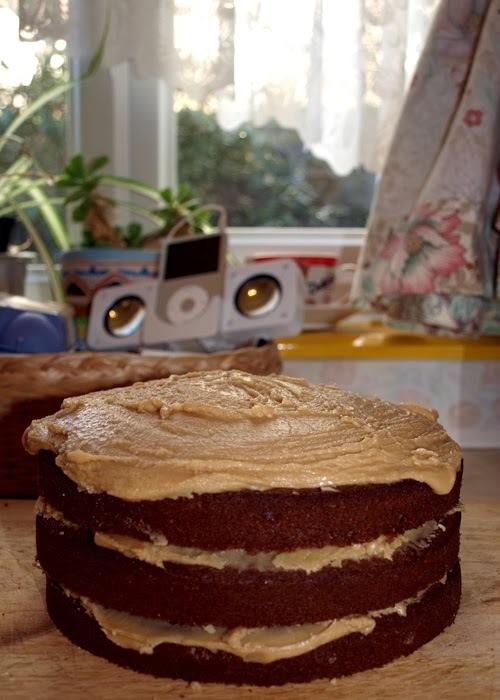 The caramel icing has almost a fudge taste to it and makes the cake a very, very sweet one (although I did make the mistake of letting it set a little too much before putting it on the cake, so that could just be my mistake), so I'd suggest eating this in small slices even for the most sweet-toothed. The chocolate sponge itself though is one of the tastiest I have ever eaten, so I'll definitely be baking it again, but maybe with a different icing. Preheat the oven to 190ºC/gas mark 5. Grease 3 x 20cm sandwich cake tins and line the bases with baking paper. Melt the chocolate: you can do this in a heatproof bowl set over a saucepan of simmering water on the hob, but the easiest way is in the microwave - place the chocolate in a microsafe bowl and heat on a medium heat for 1 minute, stir and then microwave again for a further minute - but be very careful not to burn the chocolate. Leave to cool slightly. In a bowl cream the butter and sugar together, using an electric hand mixer, until pale and smooth. Slowly add the egg yolks and beat well. Next, add the melted chocolate and beat well again. Sift the flour, baking powder, bicarbonate of soda and salt into a separate bowl and stir together. Measure the milk into a jug and stir in the vanilla extract. Gradually add alternate amounts of the flour mixture and the milk to the chocolate, butter and sugar mixture, beating well after each addition. In a clean bowl and using a clean whisk, whisk the egg whites until stiff peaks have formed. Then, using a spatula, carefully fold the egg whites into the main batter until it is all combined. Divide the batter evenly between the tins (use between 500g and 600g batter in each tin unless your name is Stasia and you only made 1 batch of batter like a ninny) and smooth the tops with a spatula. Bake in the centre of the oven for about 30 minutes, until a skewer inserted into the centre of one of the cakes comes out clean. Leave the cakes to cool slightly in their tins for about 10 minutes before turning them out onto wire racks to cool completely. Combine the butter, milk and brown sugar in a heavy-based saucepan and put on the hob over a high heat. Stirring continuously, bring the mixture to a boil. Allow it to boil for 1 minute, then remove from the heat and stir in half of the icing sugar. Allow the mixture to cool slightly, then add the rest of the icing sugar and the vanilla extract and stir until it thickens to the desired consistency. It will have a slightly runny consistency, which works well with this cake. If you leave it and it starts to set, just transfer to a microsafe bowl and soften it for a few seconds in the microwave before beating again and, if necessary, add a little double cream. Remove the sheets of baking paper from the bases of the cakes. 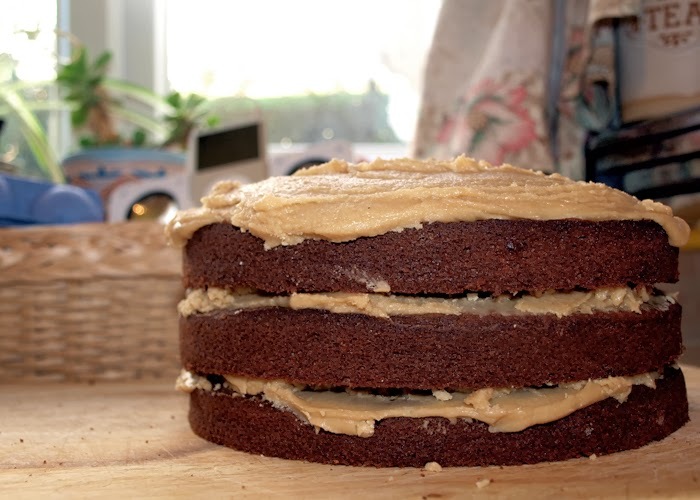 Ice the top of each cake with the caramel buttercream and allow it to set a little before sandwiching the cakes together and serving.